First Listen: Oneohtrix Point Never, 'R Plus Seven' In zooming in on the material nature of the sounds to which he pays homage, Daniel Lopatin directs focus to the individual voices taking part in dance music's ever-evolving conversation. Oneohtrix Point Never's new album, R Plus Seven, comes out Oct. 1. The dance floor is both the lungs and the trading floor of music. New sounds and structures are breathed in and out on the dance floor, in a rich exchange of ideas that are disseminated on a global scale. It's a space that allows for new shapes — no, demands them — because bodies need new lines to trace and new energy to feed off. This is new territory for Daniel Lopatin, a.k.a. 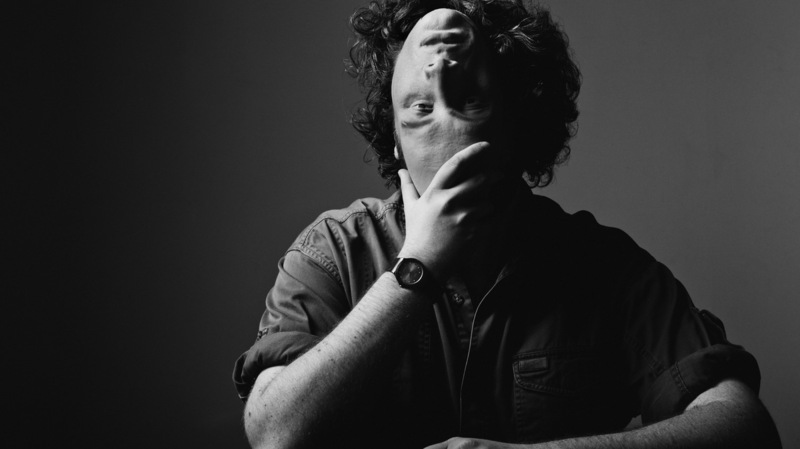 New York avant-garde musician Oneohtrix Point Never. That isn't to say R Plus Seven is a dance-music album — it's not — but that it's alive with vibrations from the dance floor. It's Lopatin's most colorful record to date, almost delightful at points, as well as delighted with itself. To say it's a curve ball would be to miss a trick, though. While form-wise his early albums skirted the drone and noise worlds, earning him hyperbolic descriptors like "synth lord," his approach has always been about excavation. 2011's Replica was concerned with memory and media; with how the two obstruct and abstract one another. For R Plus Seven, Lopatin's debut album on new home Warp Records (out Oct. 1), Lopatin focuses in on the act of listening itself. Which is where the dance music comes in, via super-specific and sometimes startling references. "Inside World" features synths that recall the cool allure of Fatima Al Qadiri, while "Zebra" opens with a hyperactive rush evoking Gold Panda. There are moments in both "Americans" and "Problem Areas" that evoke Far Side Virtual, James Ferraro's 2011 masterpiece that wove sinister and saccharine works from tones loaded with consumerist signals. "Still Life" features background-vocal sighs that scream Orbital and Opus III. What's more, Philip Glass and Steve Reich's footsteps can also be heard on R Plus Seven. It would be hard to believe that these references weren't intentional; instead, it's tempting to see the album as an architectural survey of this most contemporary of compositional realms. A listener's digest, if you will. Lopatin uses sound like brushstrokes: stippling it here, dabbing it there, splattering the canvas at will. Any semblance of traditional melodic or rhythmic structure is shunned, for both would swallow up the gleaming sounds he's labored to build monuments to. And, boy, do they gleam. In "Problem Areas," pointillist tones line up to do somersaults in your inner ear, while in album highlight "Chrome Country," a soft synth patch called Japanese Boy Choir is manipulated to a metallic liquid, flipping from angelic to anguished with a wink. R Plus Seven is both celebratory and reverential, excited and excitable. In zooming in on the material nature of the sounds to which he pays homage, Lopatin directs focus to the individual voices taking part in dance music's ever-evolving conversation. His role — as indicated by "Still Life," which could be the album's tagline — is of enamored observer: the artist enchanted by the changing light in the sky, painting it to forever capture the feeling for all to see.